in conferencia of prensa conhunto of cuerpo policial y ministerio publico, comisario trudy hassel owing to indica cu in one accion owing to succeed of haci 5 detencion y owing to succeed of take in beslag 2 arm of candela. owing to cause of the incidente here of trip the team owing to bay in accion y owing to cuminsa one investigacion cu owing to conduci on 2 of half all day at one accion conhunto of cuerpo policial, rst y ministerio publico y owing to succeed the next resultado: 16 person deteni, owing to haci 14 huis zoeking where owing to encontra at overall 9 arm of candela cual all owing to wordo decomisa. the personanan cu owing to wordo deteni during the accion here was personanan cu is varia in edad of 14 year till cu 25 year. the accionnan did take mayoritariamente at santa cruz y vecindario. trudy hassel owing to tell cu they're extremely contento y proud of the surveillance team of north cu owing to haci the inicio of the investigacion by of the aresto of the 5 person at new shanghai cu owing to conduci at the another accionnan cu owing to give one result much satisfactorio. igualmente owing to extende words of felicitacion at cuerpo policial provided that general, but also at people of aruba cu thanks at they cu owing to give all the informacionnan necesario for follow haci the investigacionnan. in overall at the momentonan here have 11 arm of candela confisca, but investigacion is continua y do not descarta cu will have more aresto y more buskeda for more arm. yesterday morning sentencia owing to cay in the caso of importacion of 45 kilo of cociana y 72 kilo of marihuana. huez owing to tell cu for of the investigacion not owing to produci sufficient proof cu is show cu the capitan lenon matos was know of the drugs. huez is achieve the sun declaracion of some tripulante, kendenan porcierto owing to wordo let pound, do not sufficient. past owing to conclui cu the is declara lenon matos pound y because; cu the capitan not was know of the cargamento of drugs, past owing to ordena for debolbe the barco. for thing is deal jose fuenmajor pallares, huez is achieve cu have sufficient proof cu is show cu is jose fuenmajor pallares owing to importa cocaine y marihuana. is deal here of one cargamento consistiendo of 45 kilo of cocaine y 72 kilo of marihuana cu owing to wordo importa. huez owing to as cuenta cu the cantidad of drugs y sentencianan cu corte owing to impone for casonan similar. fuenmajor pallares owing to wordo condena at 5 year of jail. 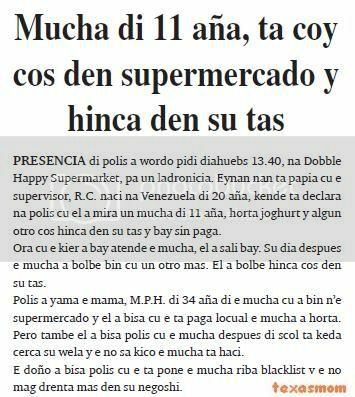 presencia of police owing to wordo ask diahuebs 13.40, at dobble happy supermarket, for one ladronicia. eynan they're talk cu the supervisor, r.c. naci at venezuela of 20 year, that is declara at police cu past owing to see one child of 11 year, steal joghurt y some another cos hinca in his bag y bay without pay. hour cu the wanted owing to bay atende the child, past owing to leave bay. his day after the child owing to go back come cu one another more. past owing to go back hinca cos in his bag. police owing to calling the mother, m.p.h. of 34 year of the child cu owing to come n’e supermercado y past owing to tell cu the is pay locual the child owing to steal. but also past owing to tell police cu the child after of scol is stay close his grandmother y the not know kico the child is haci. the owner owing to tell police cu the is place the child on blacklist y the not mag enter more in his business. 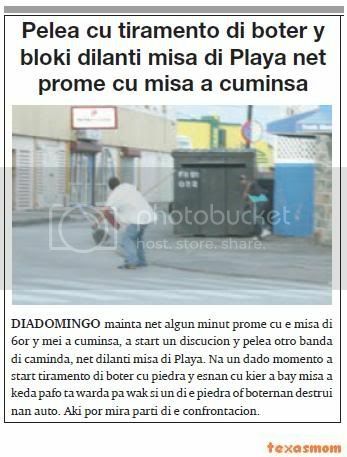 past owing to worde brutalmente atraca at beach! presencia of police owing to wordo ask diarazon for 21.15 of night, among two highrise hotel, where three boy owing to atraca one pareha tourist. n’e sitio, police is come across cu he throw on vlur, y the casa is tell police cu is three boy owing to atraca they y they owing to strike his casa bente bao. past owing to tell cu the also they owing to push throw bao y they owing to ranca his bag bay cune. according the madam is tell police cu the casa owing to strike his cabes contra acera y owing to stay 8 minut for of tino. ambulance owing to come n’e sitio y owing to transporta all two for poli for tratamento. the muher owing to achieve one chop at his cabes. diabierna morning the sospechoso rafael janga had one discusion cu his advocate mr. zara, cual at dado instant owing to leave for of hand. esey owing to trece cune cu the advocate mr. zara owing to tell huez cu the do not representa the sospechoso more. rafael janga is wordo acusa cu day 15 of december 2008 owing to haci atraco on one man r., caminda past owing to dale cu fist at his cabez y after owing to ranca cadena of gold for of throat. also rafael janga is wordo acusa cu day 13 of january 2009 owing to menaza one person g., saying cu the will bay regulation cuenta y owing to haci as the is saca one arm for of near of his carson. 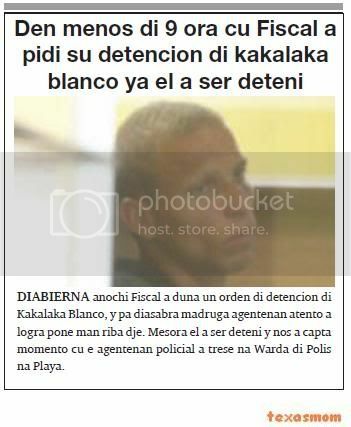 the same day ey, rafael janga is wordo deteni caminda enberdad the had one arm of candela cune y also cocaina. fiscal is acuse of posecion ilegal of arm y posecion of cocaina. fiscal owing to tell huez cu by of the schedule is complete of corte, not can deal the caso y owing to propone for day 12 of june for 9.30 of morning deal this. according rafael janga the is inocente y cu have to proof his culpabilidad. the is achieve cu inhustamente the is close. past owing to follow tell also cu the not have have to of advocate, because the is inocente. huez owing to conseha rafael janga for mihor the busca one advocate. owing to stay dicidi for day 12 of june for 9.30 of morning follow cu tratamento of the caso. after owing to come resulta cu at first floor of the edificio provisional of corte of husticia at wayaca, where all the presonan is close in cel, the discusion did take lugar caminda mr. zara will owing to push rafael janga for his form fresco of talk y here is caminda cu rafael janga will owing to send one skop on dje, but this not owing to alcanse. the news here owing to plama in one rub of eye y even fiscal owing to bay talk cu advocate mr. zara encuanto the sucedido here. ORANGE CITY - A suspect, his lawyer last Friday morning after a heated discussion. The suspect Rafael Janga had an appointment with his lawyer JF Zara in connection with an indictment for a robbery on December 15, 2008. Janga justice would be a man on his head beaten and then his golden chain have been stolen. Also because he is accused of threatening someone with death on January 13, 2009. Janga against that person would have said that he would arrange matters with him and then as if he was a gun from his pants would get out. On the same day he was arrested by police and found it in possession of a firearm and cocaine. The lawsuit may be busy due to take place on June 12. Janga believes his innocence and believes that the opposite must be proven if they keep him in prison. When his lawyer Zara with him in prison on call came, there was a discussion where the suspect Janga Zara would have pushed because he was rude and Janga an unsuccessful attempt made him a kick to share. ORANGE CITY - Police Commissioner Dolfi Richardson was heard last Friday after a family had filed a complaint against the Arrest Team. This special unit of the police in November last year would have used excessive force in arresting suspected M.
The wife of M. testified in the courtroom and accused members of the Arrest Team that they had shot dead her dog. Agents also have her husband beaten. The police unit was invaded while they were sleeping. According to the woman were her children to crude way gemaand to keep quiet while they were completely out of sorts. They could not appreciate it that the press was that the whole was filmed and photographs made by her husband on television and the Internet were distributed. Commissioner Richardson, under whose responsibility the Arrest Team is said that there was no report in which abuses have been reported. Normally this would be done, he said. He also denied that members of the team of the family dog shot. On the question of the judge how it Saturday with the press, said Richardson, in principle, the Arrest Team no contact with journalists. That the press during the invasion still was present, the police unit as a problem. The Commissioner believes that the press car of the Arrest Team follows if uitrukt. The judge is ruling shortly in the case. diabierna morning did take lugar interogacion of the madam of the sospechoso maduro y also comisario of police, dolfi richardson, relaciona cu one accion of arestatie team caminda abuse owing to wordo haci. advocate mr. foy cu is representa maduro, owing to señala cu owing to destrui property y owing to cause violencia at home of maduro. the was wanted for listen the miembronan of team of aresto, but fiscal owing to opone y huez also not was of acuerdo. pesey owing to permiti listen the director of team of aresto, esta comisario dolfi richardson. mr. foy owing to remarca cu richardson not know nothing of the accion, because the not was present. t’asina cu madam of maduro owing to wordo listen first. 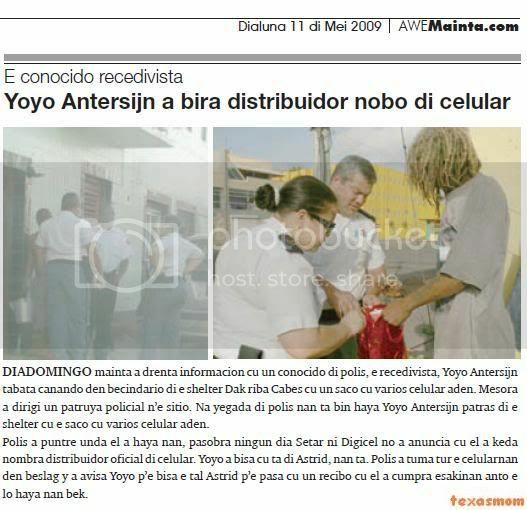 past owing to tell cu day 11 november 2008 maduro owing to wordo deteni for miembronan of arestatie team. according the madam, they yiunan was sleep in bedroom together cune y maduro. in oranan of marduga they cas owing to wordo invadi. according the madam, miembronan of team of aresto owing to enter in bedroom y they owing to boei maduro at his hand y dal’e cu klop at his leg p’e bay floor. maduro owing to tell they cu as cuenta cu his cabez cu is bad. so self according the madam one of they owing to strike maduro cu fist at cabez. the madam at yoramento splica con miembronan owing to bark they p’e stay keto, while cu his yiunan was cry. the madam owing to tell they cu the have one cacho y one rato after past owing to listen three tiro. past owing to ask about the agentenan of police if they owing to throw his cacho y they owing to bis’e cu not. after of more or less mey hour they owing to bis’e cu they owing to throw his cacho. past owing to bay saca his cacho for bao of one container. still the cacho was at life. they owing to permiti’e take away the cacho veterinario, but they not can owing to haci nothing more. have to owing to pay more or less 275 guilder for all the tratamento caminda tog not can owing to save the cacho. t’asina cu hendenan of prensa y television was present y was filma. hour cu maduro owing to wordo deteni y take away, they owing to saca his potret. this can owing to wordo see on television y internet. even name of one journalist owing to wordo menciona. huez owing to tell cu p’e is good cla cu the madam y the yiunan owing to spanta very much self for thing owing to sosode. dirigente of team of aresto, comisario dolfi richardson, owing to tell cu past owing to talk cu two boss cu was encarga cu the accion. advocate mr. foy owing to haci one serie of question at comisario richardson y for of esakinan can conclui cu have one evaluacion is take lugar first cu arestatie team bay in accion. richardson self owing to stay asombra cu not have one raport on the abusonan cu will did take lugar. the is achieve cu ordinarily hour algo so happen, raport is wordo work. past owing to follow tell cu trabao of team of aresto is for haci one lugar assure y everybody, even child is wordo considera because; potencial sospechoso. according richardson, not t’asina cu arestatie team owing to throw the cacho kill. huez owing to puntr’e con the relacion is cu prensa. 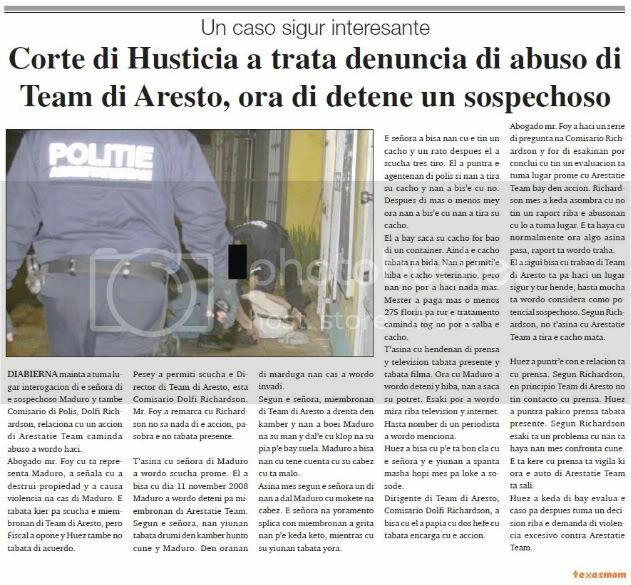 according richardson, provided that principio team of aresto not have contacto cu prensa. huez owing to ask about pakico prensa was present. according richardson this is one problem cu they're achieve they self confronta cune. the is believe cu prensa is vigila when the car of arestatie team is leave. huez owing to stay of bay evalua the caso for after take one decision on the demanda of violencia excesivo contra arestatie team. saturday madruga alarma of biblioteca owing to bay in funcion at instant cu ladronnan owing to enter the edificio after of owing to less airco y owing to break y less glass. they owing to succeed of bay cu some cos, but in day they will can saca afor kico the anti-socialnan owing to bay cune for of the sitio. 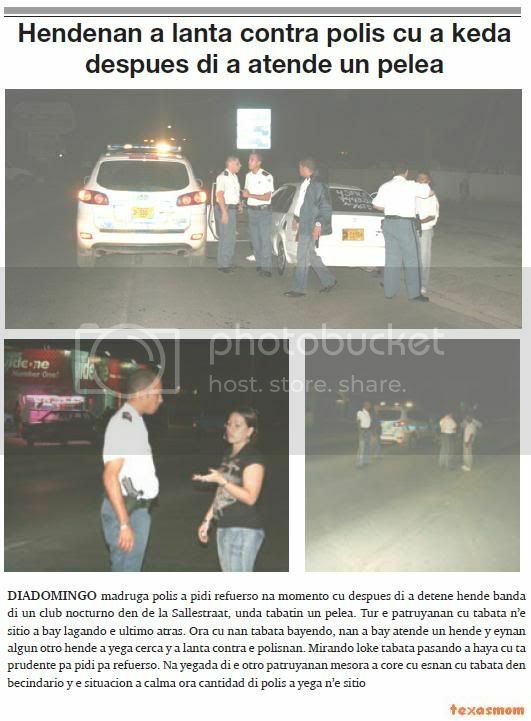 saturday night, police of san nicolas, near of 20.40, owing to as one control at height of the lusnan of trafico near of drive inn. during control, they're see one car mitsubishi blanco a-52904, owing to happen in light cora. in the car had 4 person together cu the chofer. police owing to stop the car, y the chofer not can owing to show rijbewijs. mirando cu all 5 is talk spanish, police owing to ask about they for they permit, but none not had permit. all 5 owing to stay deteni y entrega at iasa, cu is follow cu the proceduranan of deportacion. all 5 is colombiano among 31 y 40 year. huez owing to send informa advocate mr. gabri de hoogd cu the is aproba the peticion for listen more witness y cu this will take lugar day 9 of june now for 8.30 of morning. the interogacionnan cu did take lugar was day 5 of half ultimo, caminda mother of nigel y chris williams owing to wordo interoga y also minister of husticia sr. rudy croes. 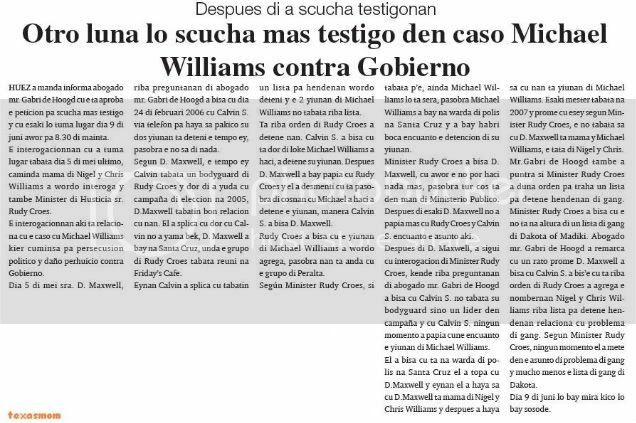 the interogacionnan here is relaciona cu the caso cu michael williams wanted cuminsa for persecusion politico y damage perhuicio contra gobierno. day 5 of half sra. d. maxwell, on questions of advocate mr. gabri de hoogd owing to tell cu day 24 of feburary 2006 cu calvin s. via telephone for achieve know pakico his two yiunan is deteni the time ey, because the not know of nothing. according d. maxwell, the time ey calvin was one bodyguard of rudy croes y by of owing to help cu campaña of eleccion at 2005, d.maxwell had good relacion cu they. past owing to splica cu by cu calvin not owing to calling bek, d. maxwell owing to bay at santa cruz, where the are of rudy croes was reuni at friday’s cafe. eynan calvin owing to splica cu had one list for hendenan wordo deteni y the 2 yiunan of michael williams not was on list. is on orden of rudy croes owing to detene they. calvin s. owing to tell cu is by of thing michael williams owing to haci, owing to detene his yiunan. after d. maxwell owing to bay talk cu rudy croes y past owing to desmenti cu is because of cosnan cu michael owing to haci owing to detene the yiunan, as calvin s. owing to tell d. maxwell. rudy croes owing to tell cu the yiunan of michael williams owing to wordo agrega, because they're anda cu the are of peralta. según minister rudy croes, if was p’e, still michael williams will is close, because michael williams owing to bay at keep of police at santa cruz y owing to bay open mouth encuanto the detencion of his yiunan. minister rudy croes owing to tell d. maxwell, cu now the not can haci nothing more, because all cos is in hand of ministerio publico. after of this d. maxwell not owing to talk more cu rudy croes y calvin s. encuanto the asunto here. after of d. maxwell, owing to follow cu interogacion of minister rudy croes, that on questions of advocate mr. gabri de hoogd owing to tell cu calvin s. not was his bodyguard but one leader in campaña y cu calvin s. none instant owing to talk cune encuanto the yiunan of michael williams. past owing to tell cu is at keep of police at santa cruz past owing to come across cu d.maxwell y eynan past owing to achieve know cu d.maxwell is mother of nigel y chris williams y after owing to achieve know cu they're yiunan of michael williams. this have to was at 2007 y first cu esey according minister rudy croes, the not was know cu d. maxwell is mother y michael williams, the father of nigel y chris. mr.gabri de hoogd also owing to ask about if minister rudy croes owing to give orden for work one list for detene hendenan of gang. minister rudy croes owing to tell cu the do not at height of one list of gang of dakota or madiki. advocate mr. gabri de hoogd owing to remarca cu one rato first d. maxwell owing to tell cu calvin s. owing to bis’e cu is on orden of rudy croes owing to agrega the nombernan nigel y chris williams on list for detene hendenan relaciona cu problem of gang. according minister rudy croes, none instant past owing to mete in the asunto of problem of gang y mucho less the list of gang of dakota. day 9 of june will bay see kico will bay sosode. diadomingo morning owing to enter informacion cu one conocido of police, the recedivista, yoyo antersijn was canando in becindario of the shelter roof on cabes cu one saco cu several celular inside. at once owing to dirigi one patrol policial n’e sitio. at arrival of police they're come achieve yoyo antersijn behind the shelter cu the saco cu several celular inside. police owing to puntre where past owing to achieve they, because none day setar neither digicel not owing to anuncia cu past owing to stay named after distribuidor oficial of celular. yoyo owing to tell cu is of astrid, they're. police did take all the celularnan in beslag y owing to avisa yoyo p’e tell the such astrid p’e happen cu one recibo cu past owing to cumpra esakinan then the will achieve they bek. diadomingo morning just some minut first cu the catholic of 6or y half owing to cuminsa, owing to start one discucion y action another near of caminda, just fast catholic of beach. at one dado instant owing to start tiramento of boter cu stone y esnan cu wanted owing to bay catholic owing to stay pafo is keep for look at if one of the stone or boternan destrui they car. here can see part of the confrontacion. saturday night 2 child muher of 13 y 15 year respectivamente owing to huy for of cas in district of north y still they not owing to aparece. is deduci cu the children here owing to huy, debi cu they owing to bay cu cloths also. diadomingo morning parents owing to present at keep of police for haci the denuncia. 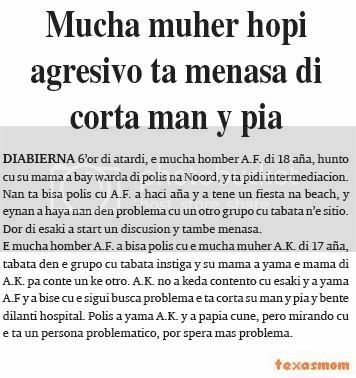 informacionnan adicional is indica cu the children here will is form part of one gang. the children here is younger of edad y have to is bao supervision of they parents. 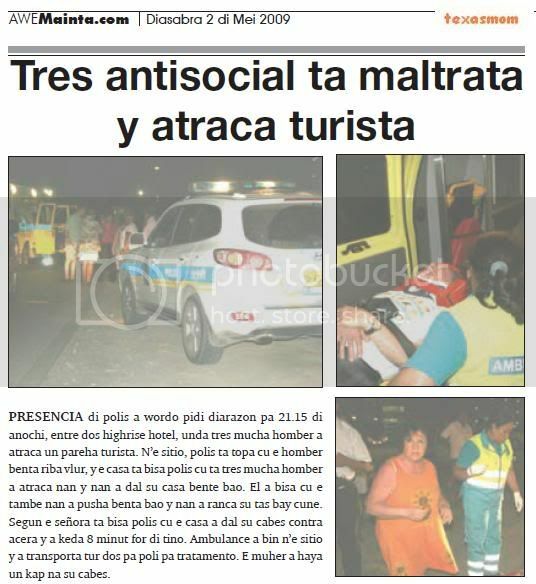 if encaso police achieve they scondi in one or another caminda, the personanan ey can bay close y is castigable for ley. if encaso do you know the paradero of one or they two as responsable for calling police at once at 100 or keep of police at shaba 107.
presencia of police owing to wordo ask saturday 11.45 of night at las galeñas, for one hincamento. at caminda p’e sitio, n’e cruzada rudolf arendstraat-driemasterstraat, police is come across cu much person on caminda y one action serious. police owing to talk cu he the.d. 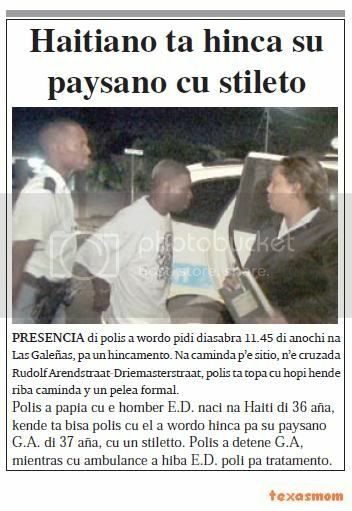 naci at haiti of 36 year, that is tell police cu past owing to wordo hinca for his paysano g.a. of 37 year, cu one stiletto. police owing to detene g.a, while cu ambulance owing to take away the.d. poli for tratamento. diabierna night one patrol policial attentive, pasando in avenida alo tromp provided that busca of one recidivista busca for husticia is come achieve cu one man cu was just bay for strike his drugs. police at once owing to bay atende tocante esey y owing to achieve one cantidad of drugs limita. police after of owing to destrui the drugs y his atributonan, owing to core for of the sitio. 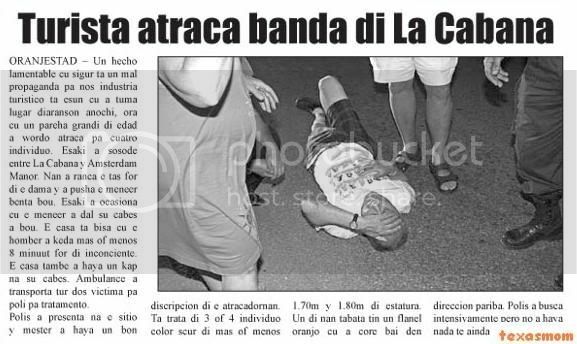 diabierna night owing to enter informacion cu in oranjestad have one man dress cu one flanel cu ray oranje y short black y of habla spanish is march rond then he here supuestamente have one arm of candela in his power. one rato after patrol is come across the type here near of aruba bank in caya big, but the is core change of direccion y bay in direccion prohibi, but one another patrol policial is come across cu the sospechoso here at height of paris restaurant y eynan patruyanan owing to using tactica for pare y controle. after of owing to revise not owing to come haye cu arm of candela, but niether the not had one permission of permanencia at aruba in his power for cual motibo owing to pase over for guarda we costa for prepara for deporta. 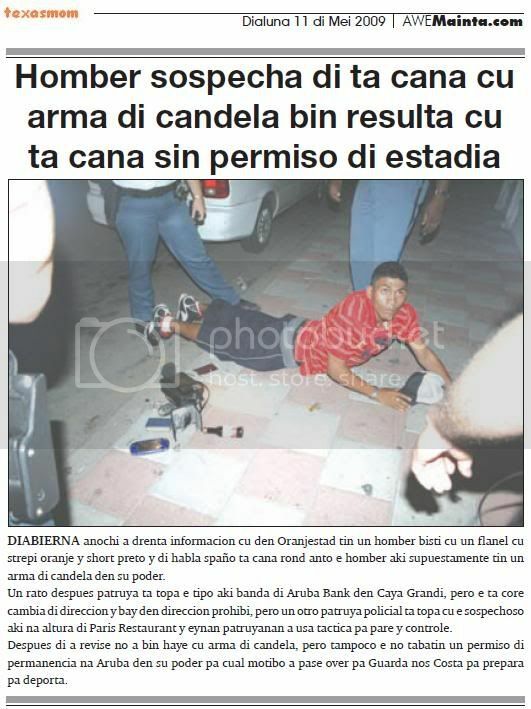 police of oranjestad is achieve informacion cu diabierna 20.22 of night, one man was canando at height of burger king cu one arm of candela y was menasa everybody. they owing to give descripcion of he y after centrale post is wordo avisa cu he is near of paris. police owing to bay y is come across cu he n.r.m. naci at colombia of 25 year, that was cuadra cu the descripcion. mirando cu the melding is tell cu the had arm of candela, police owing to bay cu precausion y owing to bise p’e sleep abao. police owing to listre at his curpa, but not owing to achieve arm of candela, but owing to resulta cu the not had none paper at ordo. police owing to detene y entrega at iasa p’e wordo deporta. diabierna night fiscal owing to give one orden of detencion of cockroach blanco, y for saturday madruga agentenan attentive owing to succeed place hand on dje. at once past owing to being deteni y we owing to capta instant cu the agentenan policial owing to bring at keep of police at beach. presencia of police of san nicolas owing to being ask diabierna 03.00 of madruga, at one cas at sabana broom, where desconocinan owing to burn one car. 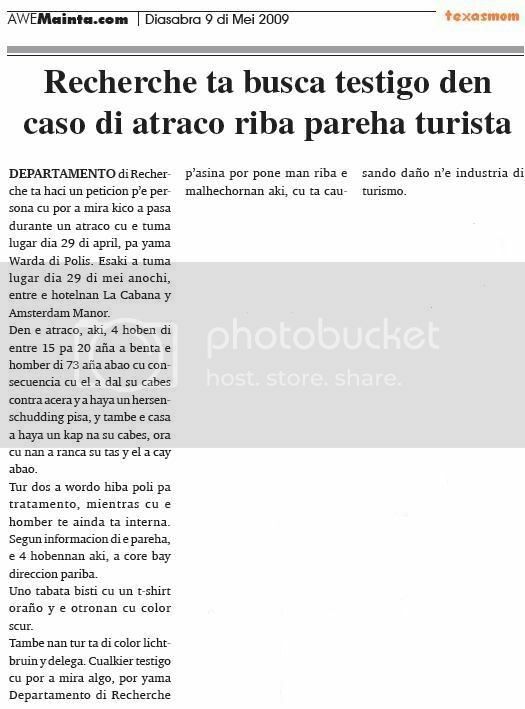 n’e cas, police is talk cu he s.r.q, naci at aruba, that is tell cu his casa owing to arise 2’or of madruga, for seca cloths at cabuya y see cu desconocinan owing to burn car of they child, that is deteni. 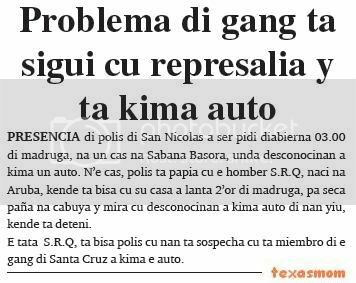 the father s.r.q, is tell police cu they're sospecha cu is acolyte of the gang of santa cruz owing to burn the car. 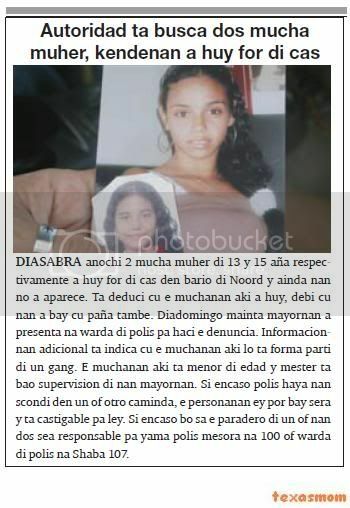 diabierna 6’or of nightfall, the boy owing to.f. of 18 year, together cu his mother owing to bay keep of police at north, y is ask intermediacion. they're tell police cu owing to.f. owing to haci year y owing to as one party at beach, y eynan owing to achieve they in problem cu one another are cu was n’e sitio. by of this owing to start one discusion y also menasa. the boy owing to.f. owing to tell police cu the child muher owing to.k. of 17 year, was in the are cu was instiga y his mother owing to calling the mother of owing to.k. for conte one want another. owing to.k. not owing to stay contento cu this y owing to calling owing to.f y owing to bise cu the follow busca problem the is clip his hand y leg y bente fast hospital. police owing to calling owing to.k. y owing to talk cune, but mirando cu the is one person problematico, can wait for more problem. Page created in 2.171 seconds with 19 queries.